Victor L. Wooten’s book The Music Lesson (Berkley Trade 2008) caught me off guard. I came across the book entirely by accident and after having read its first few pages didn’t know if I felt quite compelled to keep at it. So I put it down. And then picked it up again, kept reading a bit. And then put it down again, back and forth, oscillating on how I felt about it. The Music Lesson was speaking in common tones, asking me to forget thick theory for a moment to follow an invented story about what it means to understand music and being musical, making music with meaning—or, as the cliché goes, with heart and soul. Hmm. I put the book down, and then picked it up again. I kept at it. If I stumbled upon the book I should at least have the patience to stay a while and listen, right? As if musical skills on their own weren’t enough, Wooten is also a naturalist and animal tracker, directing a one of a kind music camp in Tennessee that teaches musicianship by way of not just musical instruction but also nature exploration. In The Music Lesson, a fictional account of a set of music lessons, we first encounter Wooten at time in his life when nothing seems to be working. He wants to improve his musicianship, but seems stuck in a rut of old practice habits that aren’t paying dividends. Then, as if by magic, a series of music teachers appear in Wooten’s life to guide him on his spiritual quest through a number of musical concepts. The main teacher is Michael, a mysterious trickster-like figure with eyes that change color on occasion and who comes across a little like a Native American sage and Zorro with a skateboard in tow. But there’s also Uncle Clyde, a homeless old man who plays a mean harmonica, Sam, a precocious boy wonder of a eleven-year old drummer who is wise beyond his years, and Isis, a quirky Russian fortune-teller with an intense interest in connection between numbers and music. Michael, Clyde, Sam, and Isis lead Wooten through a series of lessons on groove, notes, articulation, technique, emotion/feel, dynamics, rhythm/tempo, tone, phrasing, space/rest, and listening. By the end of the book, Wooten’s senses have been thoroughly reoriented, his musical life focused and energized. Scattered through the text are a number of interesting ideas about music and musicianship. Below are a few of them that struck me. First, music is inside the musician, not the musical instrument. There are many instances in the book where Michael admonishes Wooten for merely thinking of himself as a bassist rather than as a musician who happens to play the bass. The idea here is that musicality is more an orientation towards the field of the sonic rather than a technical competence on a particular musical instrument. Second, dissonance in music is contextual. For instance, while two notes a semitone apart sounded together produce a “tense” sound when heard on their own (e.g. try playing the adjacent notes C and C-sharp at the same time), when surrounded by additional tones (e.g. try adding the notes F-sharp and A above to the C and C-sharp) the dissonance can sound quite different and in fact, consonant. Third, when we say we dislike a music we are admitting a failure to perceive it adequately. In a passage about Wooten’s dislike of bluegrass, Michael tells him: “You are talking about you but blaming your lack of perception on this particular style of Music” (56). Fourth, “beauty is something you experience, not something you prove” (73). This, to me, is a pure phenomenological stance, and probably what music does best: putting out an experience in time that may not mean anything specific or prove an argument, while at the same time bringing us on a virtual ride that feels important somehow. Fifth, the idea that emotions are stored as a kind of infinite potential within a musical instrument (116). Admittedly, I had not thought much about this possibility, probably because I know myself to be more interested in what I’m feeling than what emotions may or may not be latent in the instrument. But each musical instrument certainly seems to have its own range of affective potential. Sixth, a listener’s musical attention can be shaped and directed by playing fewer rather than more notes. Here, Michael explains to Wooten a strategy for accompanying a soloist in a way that his or her solo can shine: “We were creating a hole right in the middle of the music that allowed the soloist to stand there out in the open. We also simplified the music, directing all of the attention to the soloist. . .” (140). The lesson here is that by saying less, you can not only listen more, but also give other musical speakers room to breathe. Seventh, “music is played from the mind, not the body” (158). This almost seems counter-intuitive, since musicians spend so much time refining their bodily relationship to their instruments. And yet, as listeners we’ve often had the experience of witnessing a musician who manages to hold our attention and compel us not so much through virtuosity per se but through sheer presence. The lesson here is that presence and focus are themselves kinds of musicality that transcend what the musical body can pull off. Eighth, “you need to get your thoughts out of the way so that your true feelings can speak” (216). This idea relates to point number four above. If music is not about proving anything, but rather a tool for exercising perception, then we are best ready for it when we stop worrying about what it all means. From this perspective, music just is. Finally, here’s Wooten on listening, perception and synesthesia: “What difference does it make who it is? What does it sound like and how does it make you feel? That is what is important. […] Allow your whole body to pick up the vibrations, using the whole body as an eardrum. […] We think that music stops at the ears. That is a mistake. Vibrations can be felt in all places and all times, even with the eyes. Music can be seen if your awareness is broad enough” (239-240). To illustrate this holistic approach to listening, there’s a striking passage at the end of the book where Wooten and Michael are out in the forest taking in its soundscape. As Michael learns to model his listening acuity on Michael’s, all of a sudden he’s having a full-blown synesthesia experience—seeing sound as color flowing through the forest creatures around him. (It’s pretty psychedelic actually and the image stayed with me for a while, even inspiring my own dream in which everyday objects began speaking in tones. But that’s for another blog post!) The lesson here is that there is potentially no end to listening as a full body—and even out of body—experience. In sum, The Music Lesson is an idealized account of the musician as a kind of deeply knowing, in-tune seer, healer, and phenomenologist. Michael and the other teachers in Wooten’s life are voiceboxes for the author’s own musical philosophy, and while these at times cartoonish characters are a writerly conceit, it’s a conceit that works well to get Wooten’s many thought-provoking points across. Moreover, it perhaps goes without saying that it’s difficult to talk about philosophical aspects of musical experience without risking sounding cliché or even New-Agey. So hats off to Wooten for trying. I’m glad that I stuck with his zany story to its end. Last but not least, The Music Lesson is ultimately about the importance of oral tradition to how musical traditions survive and evolve. 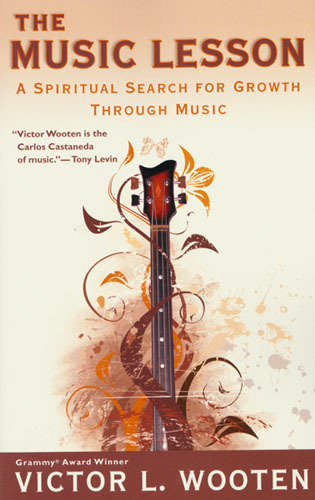 By the book’s end the narrative circles around on itself, Wooten having taken the place of Michael as a teacher himself, appearing in the life of young musician—a musician that bears a striking resemblance to Wooten himself at the beginning of the book—just at the very moment the young man needs guidance. And so Music—that presence Wooten characterizes as feminine and always worthy of a capital M—lives on as a teachable perceptual power, helping us understand both ourselves and the worlds we live in. very interesting post you have shared..